Our team offers the only FDA approved minimally invasive treatment alternative for thoracic aortic aneurysms in Alaska. Now, for the first time, there is a less-invasive method of treating thoracic aortic aneurysms. 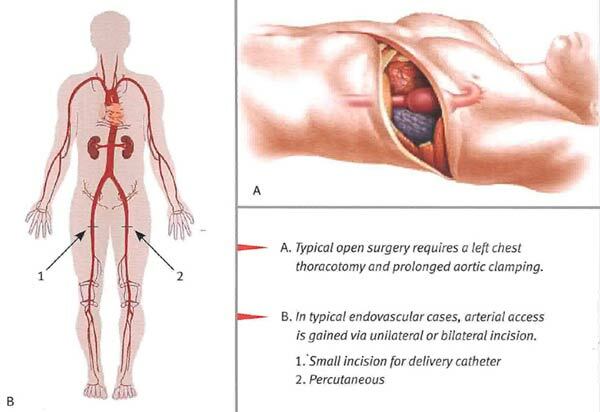 Unlike traditional open surgery that involves a large chest incision and prolonged aortic clamping, the GORE TAG Device is inserted through a small incision in the femoral or iliac arteries, advanced to the appropriate location, and deployed to exclude the aneurysm. Patients with a thoracic aortic aneurysm (TAA) risk death due to internal bleeding resulting from a rupture of their aneurysm. Unfortunately, this life-threating condition is generally believed to be signifcantly under-diagnosed because most affected individuals are asymptomatic. Until now, the only treatment available was invasive open surgery requiring an incision large enough to allow a synthetic graft to be sewn into place. The new GORE TAG Endoprosthesis can have a profound impact on the lives of patients with TAA. The following Pivotal Trial evidence demonstrates the advantages of a minimally invasive TAA procedure vs. open surgery. For more information, please contact us via email, or call (907) 375-2000.